The elaborate patterns on the wings of butterflies are one example of bilateral symmetry. Symmetry in biology is the balanced arrangement of body parts or shapes around a central point or axis. That is, the size, shape, and relative location on one side of a dividing line mirrors the size, shape, and relative location on the other side. In nature, there are three basic kinds of symmetry: spherical, radial, or bilateral. The body plans of most multicellular organisms exhibit one of these forms. A small minority exhibit no symmetry (are asymmetric). Symmetry essentially reflects order. Despite the fact that there are infinitely more ways to construct an asymmetrical body than a symmetrical one, few animals exhibit an asymmetrical body plan (Than 2005). Bilateral symmetry is so common—and fossil evidence showed it had taken hold in animals as early as 500 million years ago—that many scientists think that it cannot be a coincidence (Than 2005). Scientists also recognize that an object’s symmetry relates to its aesthetic appeal, and that humans are particularly attracted to symmetry. In biology, symmetry is approximate. For example, plant leaves, while considered symmetric, will rarely match up exactly when folded in half. Furthermore, symmetry may refer only to the external form and not the internal anatomy. In spherical symmetry, any plane that passes through the center of the object divides the form into two identical halves that are mirror images of each other. Such objects are shaped like spheres or globes. For example, a round ball exhibits spherical symmetry. In nature, spherical symmetry is exhibited by the external form of many colonial algae, such as Volvox. In radial symmetry, all planes passing through a central axis (normally vertical) divides the form into two identical halves that are mirror images of each other. Such a form will have distinct ends (usually top and bottom) and any plane that passes through its longitudinal axis (a line from end to end through the center) will create two similar halves (Towle 1989). These organisms resemble a pie where several cutting planes produce roughly identical pieces. An organism with radial symmetry exhibits no left or right sides. They have a top and a bottom surface only. Animals with radial symmetry: Most radially symmetric animals are symmetrical about an axis extending from the center of the oral surface, which contains the mouth, to the center of the opposite, or aboral, end. This type of symmetry is especially suitable for sessile animals such as the sea anemone, floating animals such as jellyfish, and slow moving organisms such as sea stars (see special forms of radial symmetry). Animals in the phyla cnidaria and echinodermata exhibit radial symmetry, at least some time during their life cycle. Sea cucumbers, an echinoderm, demonstrate bilateral symmetry as adults. Plants with radial symmetry: Many flowers, such as buttercups and daffodils, are radially symmetric (also known as actinomorphic). Roughly identical petals, sepals, and stamen occur at regular intervals around the center of the flower. Tetramerism: Many jellyfish have four radial canals and thus exhibit tetramerous radial symmetry. This variant of radial symmetry (also called pentaradial and pentagonal symmetry) arranges roughly equal parts around a central axis at orientations of 72° apart. Members of the phyla echinodermata (like starfish) arrange parts around the axis of the forms. Examples include the Pentaspheridae, the Pentinastrum group of genera in the Euchitoniidae, and Cicorrhegma (Circoporidae). 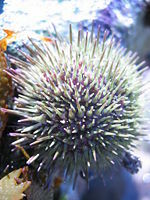 Like other echinoderms, sea urchins have five-fold symmetry (pentamerism). The pentamerous symmetry is not obvious at a casual glance, but is easily seen in the dried shell of the urchin. Flowering plants demonstrate symmetry of five more frequently than any other form. Around 1510–1516 C.E., Leonardo da Vinci determined that in many plants a sixth leaf stands above the first. This arrangement later became known as 2/5 phyllotaxy, a system where repetitions of five leaves occur in two turns of the axis. This is the most common of all patterns of leaf arrangement. In bilateral symmetry (also called plane symmetry), only one plane (called the sagittal plane) will divide an organism into roughly mirror image halves (with respect to external appearance only). Thus there is approximate reflection symmetry. Often the two halves can meaningfully be referred to as the right and left halves, e.g. in the case of an animal with a main direction of motion in the plane of symmetry. An example would be an airplane, whereby a plane passing through the center of the plane from tip to tail would divide the plane into two equal parts (on external surface). Most animals are bilaterally symmetric, including humans, and belong to the group Bilateria. The oldest known bilateral animal is the Vernanimalcula. Bilateral symmetry permits streamlining, favors the formation of a central nerve center, contributes to cephalization (concentration of nerve tissue and sense organs in the head), and promotes actively moving organisms, generally in the direction of the head. Bilateral symmetry is found in insects, spiders, worms and many other invertebrates, as well as is an aspect of vertebrates. Flowers such as orchids and sweet peas are bilaterally symmetrical (also known as zygomorphic). The leaves of most plants are also bilaterally symmetrical. Within animals, only one group exhibits true asymmetry, the Porifera phylum (sponges). Two taxonomic divisions, the Radiata and Bilateria, use symmetry as part of their defining characteristics. Radiata and Bilateria are branches of the taxon Eumetazoa (all major animal groups except sponges). The Radiata are the radially symmetric animals of the Eumetazoa subregnum. The term Radiata has had various meanings in the history of classification. It has been applied to the echinoderms, although the echinoderms are members of the Bilateria, because they exhibit bilateral symmetry in their developing stages. Thomas Cavalier-Smith in 1983 defined a subkingdom called Radiata consisting of the phyla Porifera, Myxozoa, Placozoa, Cnidaria, and Ctenophora, that is, all the animals that are not in Bilateria. The Five Kingdom classification of Lynn Margulis and K. V. Schwartz keeps only Cnidaria and Ctenophora in Radiata. Although radial symmetry is usually given as a defining characteristic of radiates, the free-swimming planula larvae of cnidarians exhibit bilateral symmetry, as do some adult cnidarians. Ctenophores show biradial symmetry, which means there is an underlying bilateral symmetry, as opposed to the complete radial symmetry of the cnidarians. The main bodily axis running between the mouth and their sensory organ, the statocyst, which lies exactly opposite from the mouth, offers a radially symmetry. This symmetry is superficially broken in the lower part of the creatures by the two tentacles and in the higher part by the digestive chamber, which is separated into several channels. The lower symmetry is shifted round from the higher by ninety degrees, forming a disymmetry or a biradial form. The Bilateria, having bilateral symmetry, are a subregnum (a major group) of animals, including the majority of phyla; the most notable exceptions are the sponges and cnidarians. For the most part, Bilateria have bodies that develop from three different germ layers, called the endoderm, mesoderm, and ectoderm. From this they are called triploblastic. Nearly all are bilaterally symmetrical, or approximately so. The most notable exception is the echinoderms, which are radially symmetrical as adults, but are bilaterally symmetrical as larvae. There are two or more superphyla (main lineages) of Bilateria. The deuterostomes include the echinoderms, hemichordates, chordates, and possibly a few smaller phyla. The protostomes include most of the rest, such as arthropods, annelids, mollusks, flatworms, and so forth. Luria, S. A., S. J. Gould, and S. Singer. 1981. A View of Life. Menlo Park, CA: The Benajamin/Cummings Publishing Co. ISBN 0-8053-6648-2. Heads, M. 1984. Principia Botanica: Croizat's contribution to botany. Tuatara 27(1): 26-48. Than, K. 2005. Symmetry in Nature: Fundamental Fact or Human Bias Live Science.com. Retrieved December 23, 2007. Towle, A. 1989. Modern Biology. Austin, TX: Holt, Rinehart and Winston. ISBN 0-03-013919-8. This page was last modified on 4 April 2008, at 01:35.